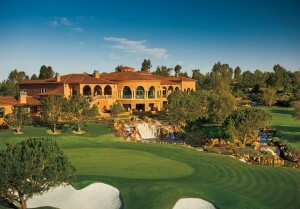 Grand Del Mar's stately, manicured grounds overlook the canyon and course. Photo Courtesy Grand Del Mar. If you seek 5-star living in your business or vacation travel, San Diego’s The Grand Del Mar has achieved a 15-star rating: 5 stars each for the hotel, spa and restaurant. 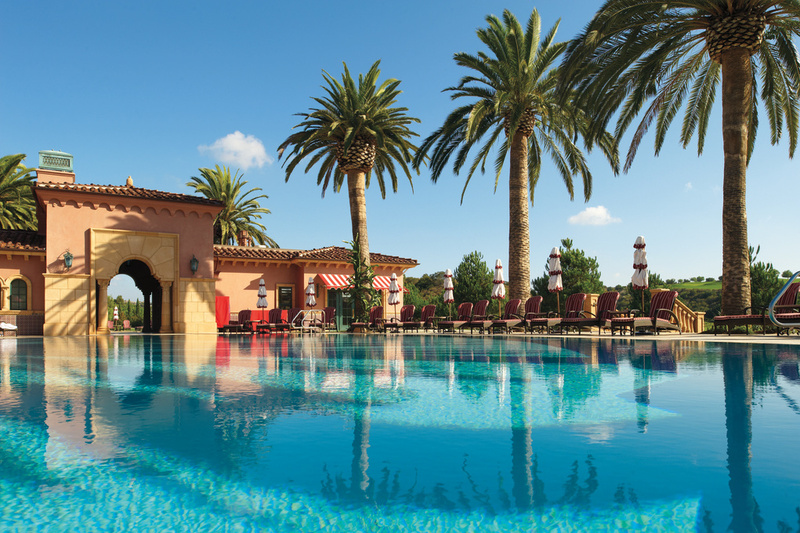 Forbes Travel Guide has granted this extremely rare trifecta of perfection in only three other instances, but none of those hotels can match The Grand Del Mar’s location along the rim of a quiet canyon in what is accepted as the world’s finest year-round climate. A scenic golf course designed by top architect Tom Fazio regularly lures the likes of local PGA Tour stars Phil Mickelson, Geoff Ogilvy, and Dave Stockton Jr., – who’s become a teaching guru. “I have never seen a better practice facility,” said Stockton, who gives individual instruction, filled with examples of his days on the pro golf circuit with the likes of Tiger Woods and his father, a Ryder Cup captain and major championship winner. Expansive, comfortable luxury suites with living areas. Photo Courtesy Grand Del Mar. Castle-like but not drafty or dusty – instead the low-rise hotel is filled with fresh flower-fumed air and exudes gleaming quality right down to every door handle and drapery. “The average hotel plans on staff members taking 15 minutes to clean a room. We allow for 45 minutes, and that’s with two chambermaids,” said Tom Voss, the sophisticated yet outwardly enthusiastic president of The Grand Del Mar. Guest suites are expansive with balconies and patios overlooking the Los Penasquitos Canyon Preserve. 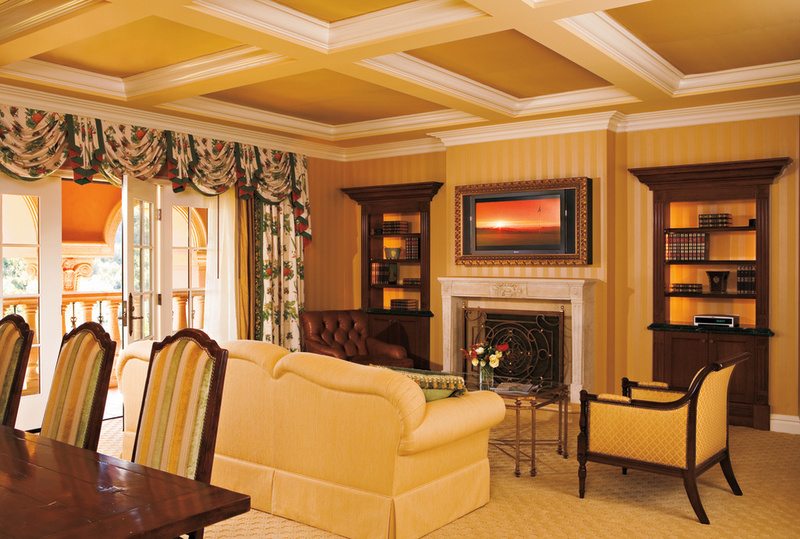 Grand Del Mar's private pool area also includes a luxury Jacuzzi with cushioned beds and chaise lounges. Photo Courtesy Grand Del Mar. The swimming pool areas are elegant but fun, with red and white striped awnings and umbrellas. In the very quiet adult pool enclave adjacent to the spa, a giant Jacuzzi is surrounded by a ring of cushioned, queen-sized lounging beds and poolside, wrought iron chase lounge chairs. While obviously up-market, no area of the resort can be considered stuffy. Elegance, here, is warm and tasteful. 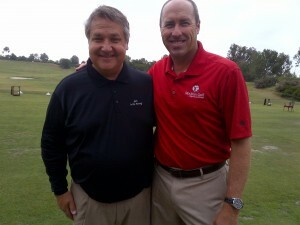 Michael Patrick Shiels with Dave Stockton Jr. When it comes to taste, Chef William Bradley’s Addison, Southern California’s only 5-star/5 diamond restaurant, sends diners on an artisanal, culinary journey via a show-stopping seasonal menu paired with rare wines. Entrees such as Kobe Beef Short Rib or Coffee Roasted Canard are offered, but only after a Razor Clam Risotto or Coddled Farm Egg, and only when fresh ingredients are available. 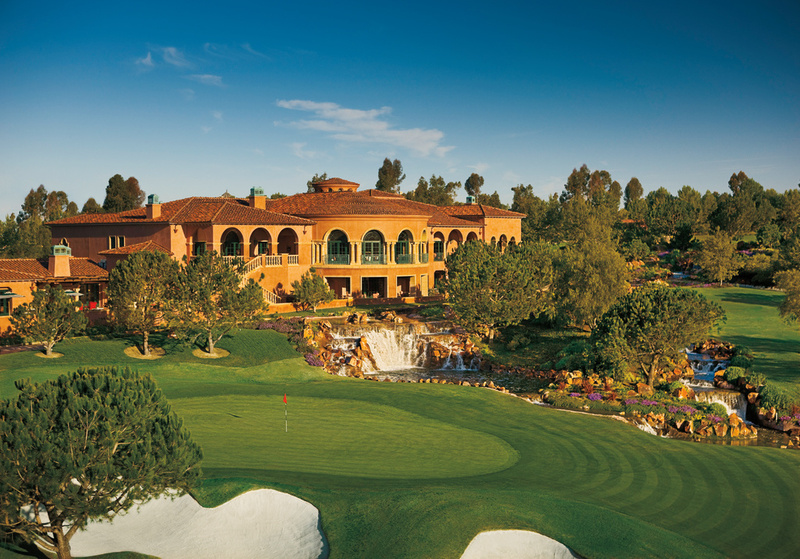 Your time is valuable, and no moment, or penny, is wasted at The Grand Del Mar, where you can experience a golf lesson with a tour pro, an herbal reflexology spa treatment, and a rare culinary experience, all in one day, in one 15-star resort footprint. <Visit www.GrandDelMar.com or call (855) 314-2030.